Stony Cove Pike at 763 metres (2503.28 feet) is also known as Caudale Moor or John Bell’s Banner. The alternative names for the fell are due to the main summit being Stony Cove Pike the second top to the west being Caudale Moor and John Bell’s Banner at 755 metres (2477 feet) is reserved for the south west ridge. The fell is wide and sprawling with six ridges leaving the summit area which is grassy with a number of small tarns between the two tops. Both tops have cairns and there is another cairn topped by a wooden cross to the south west of Caudale Moor. The main summit spouts four of the ridges to the points of the compass. These ridges follow walls that lead eastwards to Threshwaite Mouth, northwards to Hartsop Dodd, southward to Doup Crag and westwards to John Bell’s Banner. The other two ridges lead from the lower summit. One is a broad ridge that heads south passing over Pike How before descending to Raven’s Edge and Kirkstone Pass and the other is the narrow ridge of Rough Edge which descends north-west. Halfway down Rough Edge there are the remains of the extensive Caudale Quarry which was reached by what was believed to be the steepest working track in the Lake District. There is also evidence of deeper slate mining here and was last worked at the beginning of the 20th century. To the right above the quarry is the ridge and summit of Hartsop Dodd. Kirkstone Pass at an altitude of 454 metres (1,489 feet) is the Lake District’s highest pass that is open to motor traffic and in places the gradient is 1 in 4. The pass is situated on the A592 and connects Ambleside in the Rothay Valley to Patterdale in the Ullswater Valley. The Kirkstone Inn situated near the summit of the pass is the third highest public house in England. It was formerly an important coaching inn but now caters mainly for the tourist. The pass from Ambleside up to the inn is known locally as ‘The Struggle’. The pass was named after a nearby stone, the Kirkstone, which can be seen standing a few yards from the roadside and several yards from the inn. The stone is so named, as its silhouette resembles a church steeple, Kirk meaning church in Old Norse. Copper and slate mining have taken place in the area for many years and Pets Quarry still currently being worked by Kirkstone Green Slate Company lies just before the highest point of the pass on the Ambleside side. At the end of the car park we go through the gate and turn immediate right through a second gate. We then head forward over Pasture Beck following the path and after a short way we cross the stile in the wall and turn left following the track with the wall on our left. We go through a gate and keep following the wall on our left. We see some old mine workings next the beck down below. We go through another gate and just keep following the path alongside Pasture Beck all the way to the end of the valley. We now head steeply uphill following the path to the dip in the skyline. At the top we go through the wall and turn right following the wall on our right heading steeply uphill, with some scrambling, to the top. The path levels out and we soon start to bear left away from the wall heading to the summit of Stony Cove Pike. 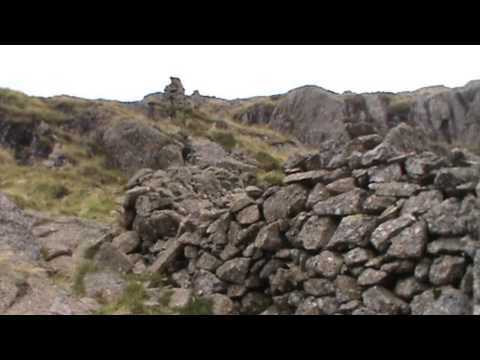 We pass a large cairn then after a short way we come to a broken wall. We go through the wall, there is a path at both sides of the wall on the other side, but we take the path on the left with the wall on our right. As we head forwards we can see a small pond on our right and a cairn in the distance. When we come to a stone cross on the ground we cross the wall and head on the path over Caudale Moor to the cairn in the distance. At the large cairn we head forwards to another cairn in front then bear left to a smaller cairn. We then turn right and follow the downhill path along the ridge of Rough Edge. We eventually go through the old Caudale Quarry and keep following the path downhill. We come to a stream and cross over to the other side and follow the path which turns right to meet the road at the Brotherswater Inn. We cross the road and walk through the pub car park towards the camp site. We turn right and follow the tarmac track and just before the road we turn left through the gap and follow the narrow path with the wall on our right until we meet the road. We cross straight over and at the sign post we turn left through the gate. We follow the path between two walls until we come to a little footbridge at Hartsop. We cross over and turn right and follow the road back to the car park. This is a moderate to hard walk on paths and tracks with steep inclines and declines. Some scrambling is required. Elevation: Approx lowest point 157.70m (517.40ft) approx highest point 716m (2496.72ft). Approx 5.5 miles allow 3 to 4 hours using OS Explorer Map OL5, The English Lakes North-eastern area. Hartsop is in the Ullswater Valley in the Lake District, Cumbria. There are no public toilets, shops or pubs in Hartsop but there is the Brotherswater Inn down the road just past Brothers Water. The next nearest facilities are at Patterdale, Glenridding and Ambleside.